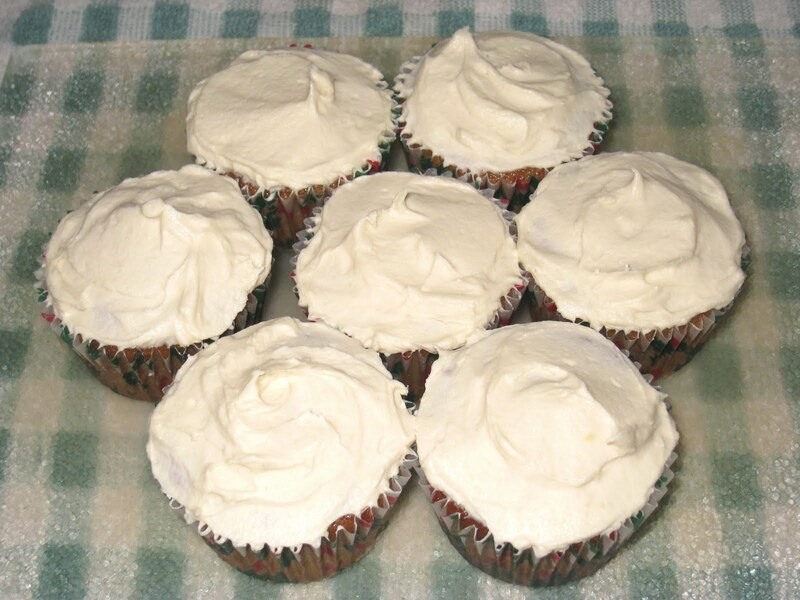 I haven't posted about sweets lately, so I thought it was time I trotted out these lovely banana applesauce spice cupcakes with cream cheese frosting. I am very proud of them, because I was able to successfully adapt a recipe without having the result explode in my oven. And they taste delicious, too! I eat bananas on an almost daily basis. I try not to buy more at a time than I can eat before they over-ripen, but I am not always successful. When this happens, I usually will decide to let them go all the way, and then I will bake something with them. Usually, it will be this banana bread recipe that has been in my family for ages. That that takes three bananas, and there was a recent occasion when I only had two bananas that were heading into over-ripe territory, so I looked around to see if I could find something that only used two. I was also looking for ways to use leftover applesauce from all of the granola I was making, so I combined the two and did some online searching. And found a recipe for banana applesauce cake that called for two bananas. What luck! So I whipped up a cake, covered it with cream cheese frosting, and had a taste. And it was . . . just ok. It was not terrible, but it was not great. I took it into work with me and the feedback I got matched my experience - good, but not great. It had potential, though, so I upped the spices and tweaked the rest of the ingredients and tried it again. I made cupcakes this time, and I was delighted with the results. They were moist and spicy, and full of flavor. I have been going lighter with the sugar on the cream cheese frosting and it contrasted beautifully with the sweetness of the cupcake. They were a big success at work, too. I have already made them again. A cautionary note: because I have been going lighter on the sugar in the frosting, it does not set as firmly as regular frosting does. 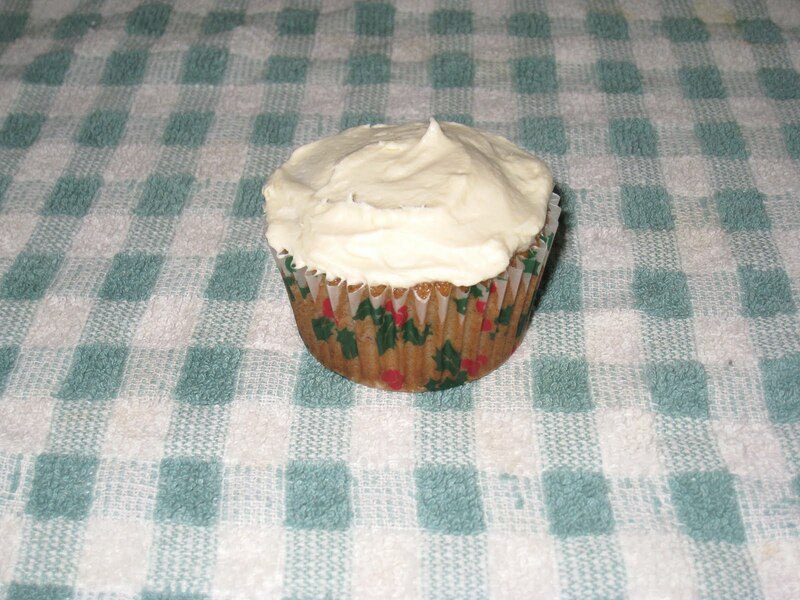 If you are going to transport them, be sure there is plenty of room between the frosting and the top of the container, or you will mash them down and end up with more frosting on the bottom side of the lid than you will have on the cupcakes themselves. Preheat oven to 350 deg. F. Line a cupcake pan with paper holders. Cream butter and sugar in a large bowl. Add the eggs one at a time, beating well after each addition. Combine the flour, baking soda and salt and sift into the creamed butter, sugar and eggs. Mix well. Add the bananas, applesauce, milk and spices and beat for another minute or so to combine all of the ingredients. Spoon the batter into each cupcake liner, about three-fourths full. Bake for 25 - 35 minutes, until a toothpick inserted into the center of a cupcake comes out clean. Cream the butter and cream cheese until it is fluffy (a hand mixer is not necessary, but definitely makes it easier). Add vanilla and beat well. Add the confectioner's sugar, a 1/4 of a cup at a time, until it reaches the desired consistency and sweetness. The original recipe calls for a 1-lb. box of sugar, but I have used as little as a cup. Using a table knife or a small spatula, spread the icing in a circular motion over each cupcake, lifting up from the center at the end to create a swirl effect. inspired by a recipe found on Chris and Nic's Recipes.